Mercedes Benz in New Zealand is appealling to slow drivers, drivers stopped at traffic lights and stalled in traffic jams, with a billboard containing one sophisticated set of questions. I must remember to test these questions out on the way to work today. My car pool workmate has just bought himself a Mercedes. 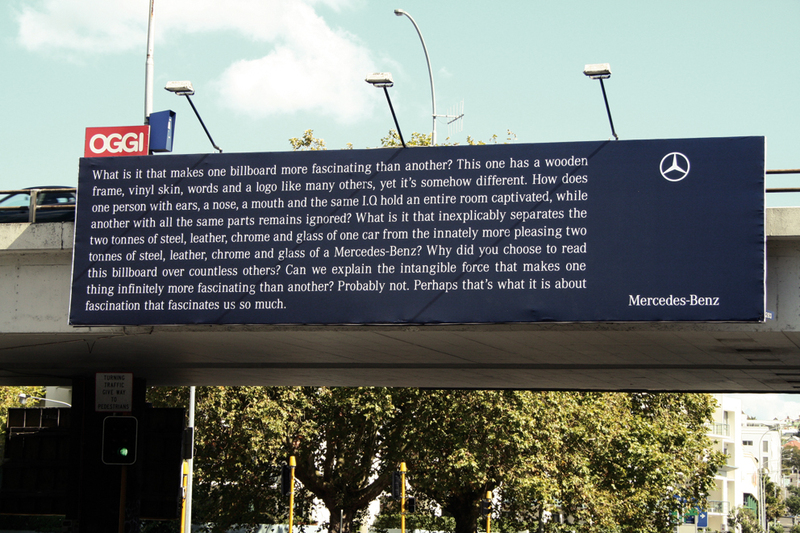 The Mercedes Benz launch was developed at Colenso BBDO, Auckland, by executive creative director Nick Worthington, creative director Steve Cochran, copywriters/art directors Simone Louis and Bradley Averill, designer Phila Lagaluga, account director Scott Coldham, account manager Janelle Van Wonderen, agency producers Paul Courtney and Gabrielle Buckle.